a party in the U.S.A! | S J M W E L L - Fashion, Beauty & Lifestyle blog. I feel like I haven't posted in week's i've missed blogging, this is a post i wrote a few week's ago but never finished properly- so I'm finally posting it. 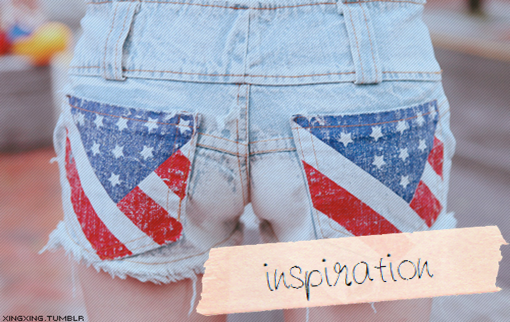 I'm sure many of you have seen Topshop's amazing usa flag short's and jean's but they can be quite pricey! so once again I'm back with another d.i.y and adapted it to what I like. 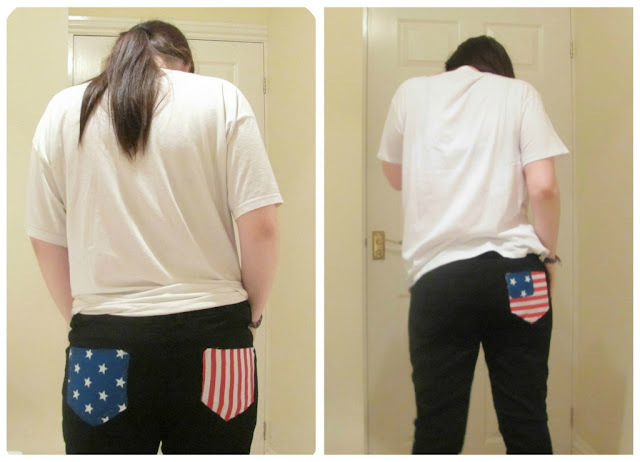 I first saw usa flag short's on Lillie's blog here and remembered I wanted to do some usa jeans a while back so i finally did! I cut a generous square from the fabric and using tracing paper drew the shape of the pocket out then on to the fabric and cut it, it may be a bit off in places so just keep trimming and checking... remember "you can always take away but never add" with this sort of thing. I did this with both pocket's, a little tip for anyone not realising... don't bother tracing another for the other pocket, just flip the tracing paper. The pockets are basically mirrored so it will work fine. You could just sew the 'fabric pocket's on by securing the fabric on with dress making pin's but i wouldn't highly recommend it. I wanted some sort of adhesive to cling the fabric to the jean as an extra glue as well as the thread. For this i used bonda web, I do prefer using the one with the paper backing because it's how i was always taught to do it and it's much easier to cut the shape exactly but I couldn't find any in my kit. Instead I used the "strip" one many people use, in-case anyone using this was un-sure how to do it (trust me in sewing class quite a few stuck bonda web to the class iron... never good.) 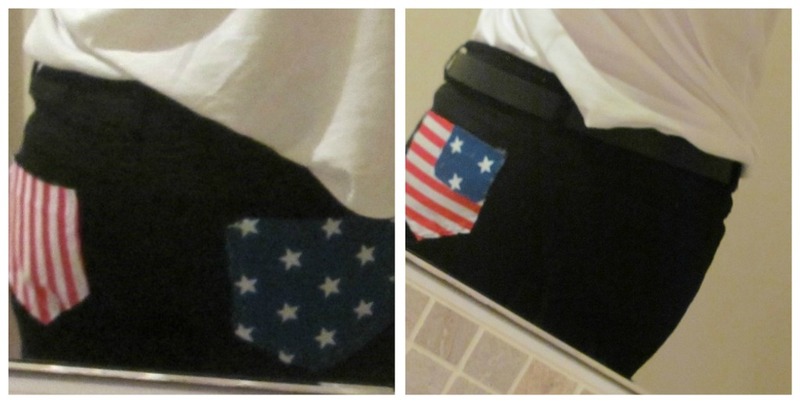 so to use this you want to cut pieces to fit the pocket like shown in the photo, make sure it is on the jean and not the fabric because you need to melt/warm the glue with the iron, you don't want the glue melting to the iron you want it to melt on the fabric! so after positioning it gently put the fabric over and make sure no bonda web pieces are sticking out ready to ruin your iron and just run the iron over, a few time's will do you don't want to burn it and it melt's quite easily! I spent about 3 hour's sewing away, took the photo ( below ) came back and after my mum & I stared at them we realised something didn't look right but we couldn't work it out. yep the stripes were the wrong way AND i just wasn't sure how well it looked. I realised because i was looking at a topshop photo where the stripes were horizontal i totally forgot to rotate. So after all that i ripped out the stitches and started again (yes on the same night, *yawns with tiredness*) but this time and to also save time i actually tried to do the american flag, just the same method, i also bonda webbed the little flag's! 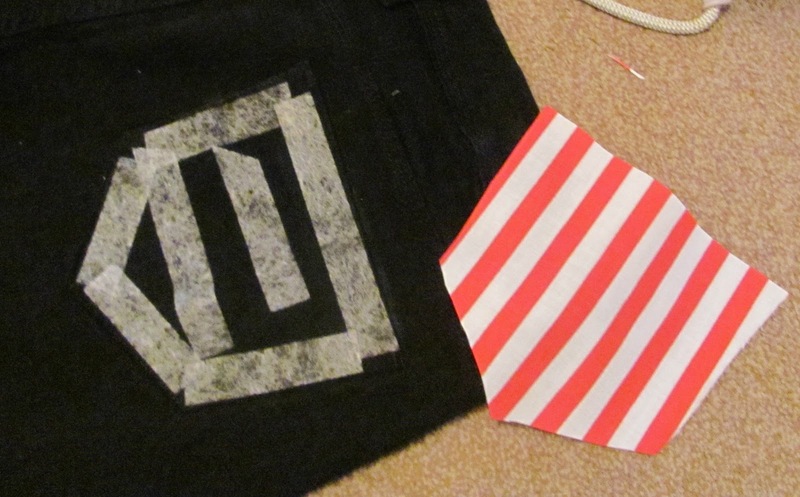 I will make a better and much neater pair with different fabric's when It isn't half way through the night. Which also explains why my camera quality is awful (below especially.) I really want to do a pair with leather pocket's... maybe stud's on a pair as well. P.S- the photo(s) below were taken in a mirror which is why the flag is 'flipped'. Having a big cuddly german shepherd helper is optional. she always always lays with me when I do diy's! I love the american flag on clothes lately, so this is for my american reader's- i see i have a few which surprised me, hello american reader's!